America’s 49th state is honored on the final coin of the America the Beautiful series from the 2012 production year. The largest state in the Union is well known for its vast expanses of untouched natural environments, and none is more impressive than Denali National Park and Reserve. 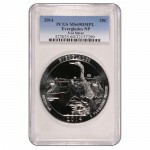 Alaska’s massive park is represented on the 2012 5 oz Denali ATB Silver Coin, available right now from Silver.com. Just 549 coins available in this grade! Available in this listing in proof-like finish. At the center of Alaska’s vast interior landscape is the highest peak in North America, Mount McKinley. Named after the nation’s president during at the turn of the 20th century, the local populace prefers to refer to the mountain by its original name: Denali. Reaching to a height of 20,321 ft, the mountain features a snow pack at the highest elevations on a nearly year-round basis. America the Beautiful releases a total of five new coins each year, with each one representing a different state or territory within the US. There are a total of 56 coins planned for the program, which will represent all 50 states, the five national territories, and the District of Columbia. 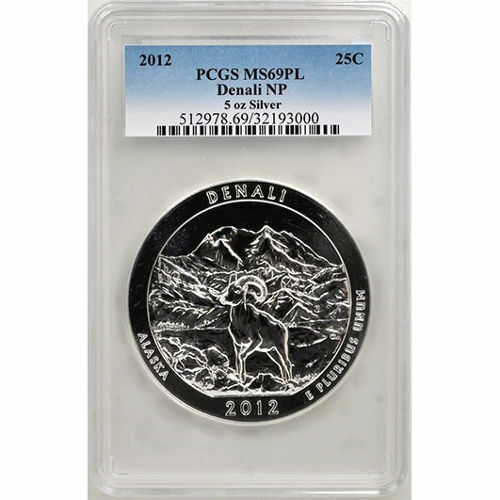 On the reverse side, a lone mountain goat is featured standing at the feet of Mount McKinley. Engravings read “Alaska,” “Denali,” and “E Pluribus Unum.” The obverse bears the same imagery found on all American quarters, that of President George Washington. Each of the coins available in this listing has an MS69 grade. 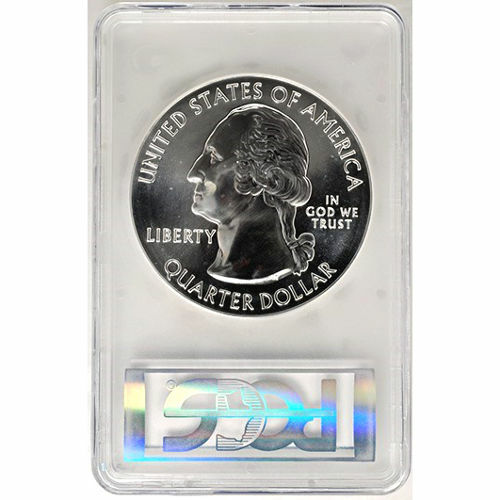 Coins in this condition have their full, original luster, and no more than two detracting marks. The proof-like finish of these bullion coins gives them a unique visual appeal. If you have any questions for a Silver.com associate about these US Mint coins, feel free to call us at 888-989-7223. We’re also available online through our live web chat and email services.